Cut through the politics and hype and discover what Bruce Lee's jeet kune do was meant to be: a martial art attitude geared towards combining sound martial arts technique with street-proven tactics to develop one's own personal fighting ability. Its goal is to teach you the true dynamics of fighting so you can defend yourself reflexively, instinctively applying the fighting skills necessary to get the job done. 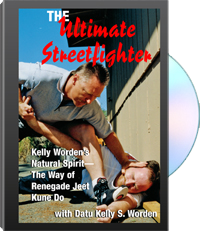 Get Kelly S. Worden at his brutal best.For information purposes only.